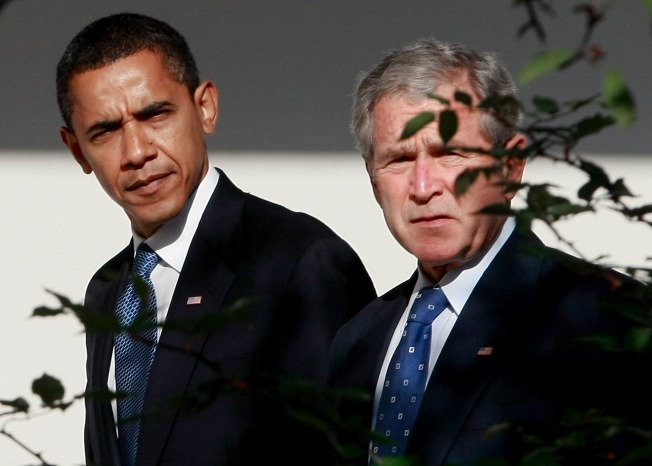 Will Barack Obama undo George W. Bush's executive orders? WASHINGTON - Washington's presidential ping-pong game plays out every four or eight years as incoming presidents reverse the policies of their predecessors. The new president can undo some of what his predecessor did, either through memoranda or executive orders, which are rules that a president can sign without waiting for Congress to legislate. Another round of the game will soon begin, as Democratic-allied interest groups urge President-elect Barack Obama to reverse some of the things President George W. Bush has done. Environmental advocacy groups like the Audubon Society want Obama to ban offshore oil or gas drilling off the Pacific or Atlantic coasts. Bush lifted an executive ban on such drilling last July, and Congress later let a legislatively-imposed ban lapse. “President Obama will have an opportunity to protect our beaches and coastal economies,” said Mike Daulton, legislative director at the Audubon Society. But The American Petroleum Institute, the trade association that represents the oil and natural gas industry, says it doesn't want Obama to re-impose the ban. Access for exploration and drilling in previously closed areas in the United States and offshore is vital to meeting U.S. energy demand, says the API. Environmental groups and many Democratic members of Congress want Obama to issue a policy directive telling the Environmental Protection Agency to declare emissions of carbon dioxide and other greenhouse gases to be a danger to public health and welfare under the provisions of the Clean Air Act. That would set the stage for Congress to pass a law forcing cuts in such emissions from power plants, cars and trucks. On a related front, Senate Environment and Public Works Committee chairman Barbara Boxer, D-Calif., said last week that once Obama takes office in January, he can promptly direct the EPA to grant her state a waiver from the Clean Air Act. That would allow California to impose stricter limits on carbon dioxide and other gasses than now exist under federal law. “The waiver would unleash, I think, the environment in which the auto companies would really have to retool and really move forward,” Boxer told reporters. Because of the way the law is written, should California succeed in getting the EPA waiver, its new, stricter emissions regulations would take effect in more than a dozen states. Car makers would be then be forced to build more fuel-efficient cars. “I think signing the waiver would be wonderful,” she said. Some of the steps that Democrats in Congress want Obama to take concern nitty-gritty stuff that only policy wonks can love. Who'll play leading environmental policy role? For instance, a Senate Democratic Committee staffer said Democrats are looking to the new president to rescind or amend a Bush executive order which gave the Office of Management and Budget a critical role in deciding environmental policy. Democrats would like scientists at the EPA, not numbers-crunchers at the OMB, to play the leading role on environmental policy. But apart from nitty-gritty bureaucratic details, some of the actions Obama could take involve high-profile, emotional controversies. The advocacy group Human Rights First wants Obama to revoke a July 20, 2007 Bush executive order which said interrogations of terrorist suspects by the Central Intelligence Agency could not use torture, inhuman or degrading treatment, or abuse that was “beyond the bounds of human decency.” Human Rights First says Bush’s order did not go far enough in controlling CIA interrogations. Here’s how the ping-pong match worked as a new president took office eight years ago. On Jan. 22, 2001, Bush signed a memorandum effectively cutting off federal funds for international family planning agencies that perform abortions. Bush thus overturned a 1993 decision of his predecessor, President Bill Clinton. Bush revived the policy that had been in effect under President Ronald Reagan and under Bush's father, President George H.W. Bush. But now with Obama about to enter the Oval Office, NARAL Pro-Choice America and other abortion rights advocates expect Obama to reverse Bush's policy. In his first days in the Oval Office in 1993, Clinton had used an executive order to rescind a “gag rule” that had barred nurses and other non-physician medical personnel at federally funded clinics from counseling pregnant women about the option of an abortion to end their pregnancy. Clinton also pleased organized labor by revoking two executive orders issued by his predecessor, George H.W. Bush, which irritated labor unions. One was a 1992 Bush order prohibiting the use of “project agreements” on federal construction sites. Project agreements are labor contracts which cover all the trade unions, from electricians to carpenters, who work on a federal building project. When George W. Bush became president in 2001 one of his first executive orders rescinded the Clinton executive order on project agreements. Bush said he wanted to “ensure open competition” and “prevent discrimination” by opening the bidding process to non-union firms. In 1993, Clinton had signed an executive order revoking a George H.W. Bush executive order which had required contractors to post notices at workplaces informing employees that they are not required to join unions in order to keep their jobs. While executive orders have symbolic and some substantive value, they shouldn’t necessarily be read as definitive indicators of which way a president will steer policy. Clinton’s early executive orders favoring labor unions were not an accurate harbinger of the fights he’d later wage with the unions over international trade agreements such as the 2000 trade accord with China. Organized labor fought the China trade accord fiercely, but to no avail.